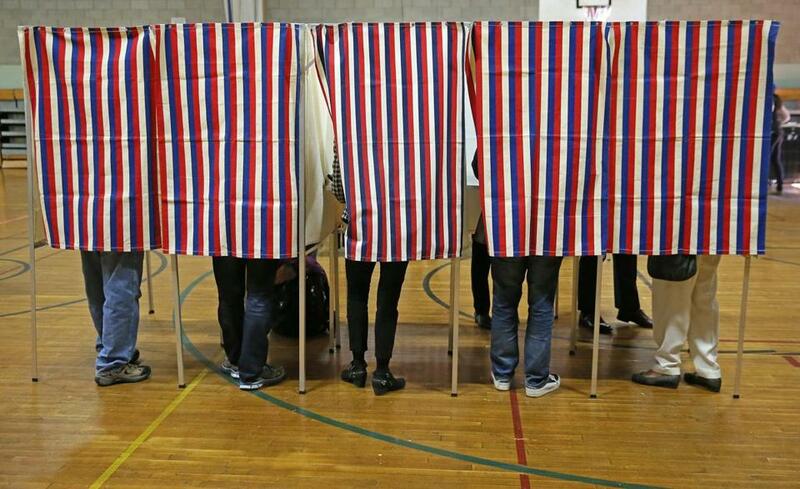 Voters cast their ballots in Cambridge Tuesday. After casting his ballot Tuesday morning at First Church in Swampscott, Governor Charlie Baker said this year marked the first time he didn’t vote in the presidential election. “I’m obviously disappointed about that,” Baker, a Republican, told reporters. “I said many months ago that I wasn’t going to be able to support Donald Trump for a number of reasons, and I thought Hillary Clinton had believability problems, and nothing has happened in the last nine months to change my mind on that,” the governor said. Baker said he voted no on Question 1, which would allow the state to license a second slots parlor; yes on Question 2, which would lift the cap on charter schools; yes on Question 3, which would limit the sale and production of food from animals kept in tight enclosures; and no on Question 4, which would legalize recreational marijuana.